Read Novartis's statements on its generic medicines court case, and learn why they're wrong. This is not the entire truth. Doctors Without Borders/Médecins Sans Frontières's (MSF’s) field experience in many developing countries shows that when a patent is granted it has a direct bearing on access to affordable medicines. Granting a patent on a medicine provides the patent holder with a monopoly on that medicine, which in turn allows the company to charge a high price in the absence of any generic competition. In fact, improving access to medicines is a matter of not simply making the medicine available but also making it affordable for patients and governments to buy. When AIDS treatment first became available in the late 1990s, the price of first line patented AIDS medicines was—even after discounts—US$10,439 per patient per year. Millions died in developing countries, particularly in Africa, as prices were too high. Generic competition brought prices down, making treatment possible. Patents on medicines are a key barrier to making medicines affordable, as it prevents access to those who cannot afford it. 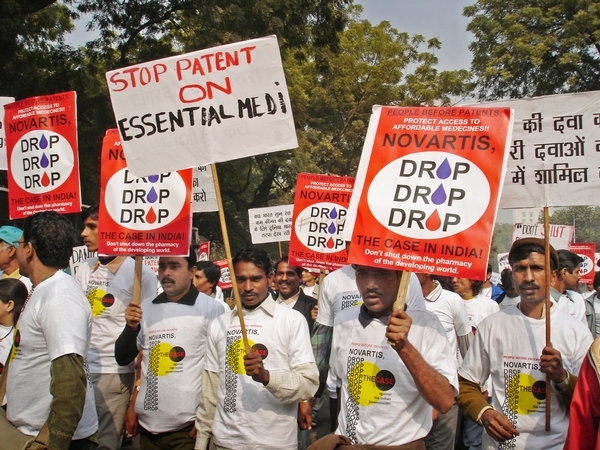 If Novartis succeeds in weakening the interpretation of Section 3(d) for the purpose of obtaining a patent on imatinib mesylate, the Indian Patent Office would have to apply the same standards of intellectual property protection as wealthier countries like the United States, granting far more patents than required under international trade rules or as envisioned by India’s lawmakers. This case is not only about this particular medicine (imatinib mesylate). The interpretation of the clause has a direct bearing on the examination of patent applications claiming salt forms, pediatric formulations, and other formulations of AIDS drugs like fixed-dose combinations, such as the ones currently used by MSF in its medical projects. The interpretation of Section 3(d) sought by Novartis would allow these drugs to be patented under India’s patent law, whereas right now patent applications on several of these new forms of existing medicines have been successfully opposed by health groups in India. And it’s not just about India. If generic competition on many crucial medicines ends, then prices for these medicines will increase, both in India and across the developing world. This would have a devastating impact on not only people MSF treats, but also on people the world over who rely on affordable medicines manufactured in India. MSF buys 80 percent of the antiretroviral medicines (ARVs) it uses to treat 170,000 people for HIV across the developing world from Indian generic manufacturers, and donors rely on Indian sources in the same proportions, and over 80 percent of all HIV and AIDS medicines bought by donors also come from India. In the case of treatment for pediatric AIDS, Indian generic producers supply over 90 percent of medicines used in developing countries. It is critical that the health safeguards of India’s patent law—particularly Section 3(d)—are preserved. The future of generic production is largely dependant upon the outcome this case. Imatinib mesylate is a crucial anti-cancer drug sold by Novartis in India for Rs.1,20,000 (US$ 2,400) per patient per month. Indian generic companies sell generic versions for Rs. 8,000 – 10,000 ($160 – 200) per patient per month. This is not what international trade rules say. Although the World Trade Organization’s (WTO's) Agreement on Trade Related Aspects of Intellectual Property Rights (TRIPS Agreement) obliges all WTO members, including India, to grant patents on medicines, nothing obliges developing countries to replicate the patent systems of wealthy countries. An important flexibility in this respect is the right of WTO member states to define what deserves a patent and what doesn’t, in accordance with their particular national priorities. This is precisely what India did when it amended its patent law in 2005. At the time of implementing the TRIPS Agreement, India benefitted from the experience of other countries where a large number of patents on new uses and new forms of known medicines had been granted, which was creating longer patent barriers and high prices in developing countries. So, along with patent protection for new innovative medicines, Indian lawmakers introduced a specific provision, Section 3(d), in the patent law that excludes from patentability new uses and new forms of known medicines. The system India has is not perfect, but it does prevent pharmaceutical companies from getting unjustified 20 year monopolies every time they come up with a new use or a new form of a known medicine. Section 3(d) is about ensuring that innovation is rewarded with a patent only when it deserves to be. Under this provision, new forms of existing medicines cannot be patented in India unless the patent applicant can show a significant increase in efficacy. Novartis is seeking a patent in India on the salt form (mesylate) of imatinib (brand name: Gleevec). Claiming a patent on a salt form of an existing medicine is a common practice of pharmaceutical companies to extend the patent life—and therefore the monopoly and the high prices—of medicines. This is known as "evergreening," and companies do this routinely to prevent generic competition. An example of this is the HIV drug abacavir. Although the abacavir molecule was first developed and patented in the 1980s, pharmaceutical company GSK applied for a patent in 1997 on abacavir sulphate (salt form) in developing countries, with the intention of obtaining a patent monopoly until 2017. In the countries where the patent was granted, this has blocked access to affordable generic forms of abacavir. As a new form of an existing medicine, imatinib mesylate is indeed subject to the scrutiny of Section 3(d). After unsuccessfully trying to have Section 3(d) struck down in the Madras High Court, Novartis is now attempting to weaken the interpretation of Section 3(d) in the Indian Supreme Court. Countries do indeed have the legal right under international trade rules to issue compulsory licenses to overcome drug patents where they hinder access to essential medicines—these are the "access safeguards" Novartis is referring to. But these are not the only rights they have under these rules to ensure access to medicines. Novartis seems to be implying here that countries can only act once patents have been granted. But countries can also take steps before it’s too late, and ensure that patent applications on routine and obvious improvements of medicines are not granted so that they do not disrupt supply of affordable generic medicines to patients. India has chosen to adopt this safeguard with the introduction of Section 3(d) in its patent law, while allowing patents to be granted on new medicines from 2005. As regards the "special pricing arrangement" measure that Novartis refers to—this is also known as tiered pricing, when companies charge high prices in wealthy countries, medium prices in middle-income countries, and lower prices in the poorest countries. Tiered prices have not proven to be the most effective way to make medicines affordable, often coming with strings attached and maintained at the whim of the pharmaceutical company. In fact, tiered pricing is first and foremost a profit-maximizing strategy, where companies get the highest profits in high-income countries, while still earning money in countries that cannot afford rich-country prices. MSF’s annual analysis of HIV drug prices and tiered pricing policies also shows that middle-income countries are increasingly being excluded from the standardized discounts offered by pharmaceutical companies. It is only with unfettered generic competition that medicine prices are driven to their lowest and sustainable level. Note: The basic molecule imatinib was first patented in the US (US 5521184) in 1993. India signed the WTO TRIPS agreement in 1995 and opened up filing of product patent applications in India. In 1998, Novartis filed an application 1602/MAS/1998 on the mesylate salt of Imatinib. This case relates to the 1998 application.